I know what you're thinking. "Baked. Fontina. Are you kidding me?" I thought it too, when I first flipped through Ina Garten's new cookbook, How Easy is That? This recipe stopped me in my tracks. First of all, why have I never though of this? Second of all, how soon can I make it? I bought her cookbook the day it came out (which was last Tuesday), and I made this on Friday night. I had my neighbor over for a girls' night, and I though this, (along with roasted figs with prosciutto), would be the perfect dinner. It turns out, this is the perfect dinner for pretty much any occasion. Melted cheese? Garlic? Fresh herbs? Yes, please. I really try not to be too overly effusive with my praise recipes when I post here, but with baked fontina, how could I not be? Fontina is pretty delicious on its own, but throw it under the broiler with olive oil, garlic, and fresh herbs, and it's elevated to a completely new level. This is sort of like fondue, but I would argue that it's even better. You get a nice and crusty top from the cheese being under the broiler, and if there is anything better than melted cheese, its melted cheese with a browned, crusty top (though that sounds kind of gross, doesn't it?). Joey happened to be going out to a poker night when I made this, but he couldn't resist trying a few bites before he left. And he just kept eating more and more, until he was late for poker night. I loved this so much that I made it again the following day for lunch. And Joey has said that I should just add this into the weekly dinner rotation permanently. Maybe next time I make it I can get a better picture of it, but really, melted cheese is surprisingly hard to photograph. The Barefoot Contessa, How Easy is That? Preheat the broiler and adjust the oven rack to 5-6 inches from the heat source. Scatter the Fontina cubes evenly in a 12-inch skillet or cast-iron pan. Drizzle with the olive ol. Combine the garlic, thyme, and rosemary, and sprinkle evenly over the cheese. Sprinkle with the salt and pepper. 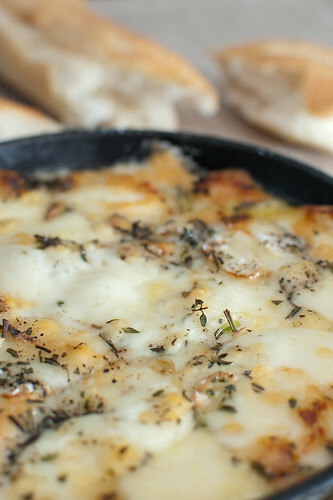 Place the pan under the broiler for 5-6 minutes, or until the cheese is melted, bubbling, and starting to brown. Serve family-style: right out of the oven with crusty chunks of bread for dipping. Received my copy of Ina's new book last week and this recipe sang to me also. Can't wait to try it, but a little afraid of how much I'll like it!! I am so so so making this, quite possibly tonight! I got Ina's new book too and have this recipe flagged. Based on your rave reviews, now I need to make it sooner. It looks awesome. Must make this next time we have guests. It looks fabulous! OMG is right. can't wait to try this. simple is always best, isn't it? I literally had this cookbook in my hands yesterday and was flipping through it. However, if I would have seen THIS recipe, I would have promptly bought it. This looks amazing...I cannot wait to try it! I made this as an appetizer for Christmas Eve - it was DELICIOUS! Thank you for sharing! It got rave reviews from everyone! I loved this - however I don't see why you need the oil. After baking it, it was SWIMMING in oil & so i poured off the top layer. Also - my garlic didn't cook & i'm not a fan of raw garlic so i tossed it back in the oven at 350 degrees for 15 minutes or so. The flavor on this reminded me of pizza cheesy bread - but yummier! Yes, a big hit for New Years Eve with my dinner group of 10 years, Dinner Saints. I served it in the cast iron skillet as recipe called for. Nice because it stays hot quite awhile in the cast iron. I served it with rosemary foccacia, delicious.